Venetoclax (VEN) is a selective, potent, orally bioavailable BCL-2 inhibitor. VEN monotherapy induces rapid, deep, and durable responses, with a 79% ORR (20% CR) for patients (pts) with relapsed/refractory (R/R) chronic lymphocytic leukemia (CLL) or small lymphocytic lymphoma (SLL). Based on preclinical evidence of synergy, combination therapy of VEN plus rituximab (R) is being assessed in an ongoing Phase 1b study. 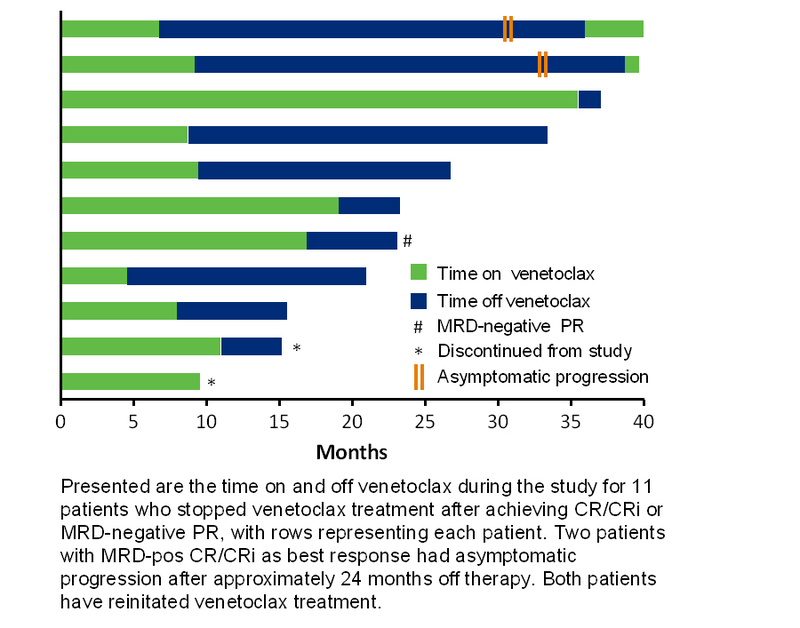 In this study, pts with CR/CRi or MRD-negative (neg) PR may stop VEN, remain on study, and be retreated upon disease progression by iwCLL criteria. To assess outcomes in pts with R/R CLL who had CR/CRi or MRD-neg PR and stopped therapy per study protocol. Pts who achieved CR/CRi or MRD-neg PR could stop therapy and remain on study with clinical monitoring and peripheral blood (PB) counts every 3 months. Pts who then progressed could re-initiate VEN once daily with weekly ramp-up at 20, 50, 100, 200 to 400 mg. R could be added at month 4 or earlier per investigator’s discretion. Responses and progression were assessed by iwCLL criteria with CT scan and bone marrow (BM) biopsy. MRD was assessed in blood and BM aspirates using ≥4 color flow cytometry (min sensitivity: 0.01%). 49 pts (48 CLL/1 SLL) were enrolled. Median number of prior regimens was 2 (range: 1–5); 45 (90%) received prior R (14 [29%] R-refractory) and 28 (57%) received fludarabine (9 [18%] fludarabine-refractory). 15/45 (33%) pts had del(17p) and/or TP53 mutation. Common adverse events (AEs) were mild diarrhea, neutropenia, upper respiratory tract infection, and nausea. As of 28Oct2015, ORR was 86% (47% CR/CRi), with 55% MRD-neg (17 CR/CRi; 10 PR). While on therapy, disease progression was observed in 7 pts, with 4 occurring after PR, 1 after SD, and 2 had primary PD.11 pts elected to stop therapy after achieving MRD-neg CR/CRi (8), MRD-pos CR/CRi (2), or MRD-neg PR (1); 9 remain in active follow-up and 2 discontinued from the study with no evidence of progression. Demographics and disease characteristics of these 11 pts were similar to the total study population and median time on VEN was 9 (range: 5–36) months. As of 28Oct2015, 7/9 pts have not progressed (all MRD-neg) and remain in follow-up for a median of 8 (range: 2–25) months off VEN.2 pts with MRD-pos CR/CRi as best response had subsequent asymptomatic progression off VEN. The first pt stopped VEN plus R at month 7 and had asymptomatic progression (lymphocytosis, BM infiltrate, and splenomegaly) 24 months later. This pt was retreated with VEN monotherapy, achieved PR after 4 months of VEN, and remains in response with ongoing treatment. AEs reported during retreatment were all Grade 1/2 and similar to those seen during first treatment. The second pt stopped VEN at 9 months and had asymptomatic progression (lymphocytosis) 24 months later (PB MRD levels increased after 14 months off VEN). This pt recently reinitiated VEN monotherapy and has not yet had disease reassessment. The combination of VEN plus R induced deep responses, with 47% pts achieving CR/CRi and 55% reaching MRD negativity in BM. The rate of disease progression was low for pts continuing VEN with current follow-up. Pts achieving deep responses who stop VEN per study protocol do not relapse rapidly, and treatment-free remissions can be durable, as 7 MRD-neg pts still off VEN maintain remission to date. Progression has been observed after 24 months off VEN in two pts whose best response was MRD-pos; preliminary data suggest that ongoing retreatment is well tolerated and effective.